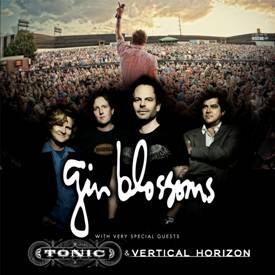 GREENSBORO — Gin Blossoms, with special guests Tonic and Vertical Horizon, will play on Sunday, June 30 at White Oak Amphitheatre at the Greensboro Coliseum Complex. Tickets go on sale Friday, April 13 at 10 a.m. at LiveNation.com, via the Live Nation app, the Greensboro Coliseum box office, Ticketmaster, or by phone 800-745-3000. In 1996, the singles “Follow you Down” and “As Long As It Matters,” hit the radio again in a huge way, making their Congratulations I’m Sorry record another platinum success. Gin Blossoms hits have crossed over in five different formats, taking the airwaves by siege, and held the MTV playlist captive for most of the 90s. Boasting record sales of over 10 million, the band continues to burn up the road performing over 120 tour dates per year as they ready a brand new record release in Summer 2018. Don’t miss all these great hit songs, a sampling of new music, and a rockin’ the house down show! With six top 10 singles, over 4 million records sold, multiple Grammy nominations, platinum albums, hit songs around the world including the #1 most-played rock song of 1998, it is safe to say that Tonic is a musical powerhouse. Merging the raw honesty of rock with their unabashed melodies Tonic have helped usher rock n roll into the new millennium. Many bands would be content with that sort of history. Tonic breaks the mold. Hart founded Tonic with guitarist Jeff Russo – a childhood friend – adding bassist Dan Lavery shortly after inception. After storming the charts with debut album Lemon Parade and its monster hit “If You Could Only See,” the band released two additional studio albums (Sugar, the twice Grammy-nominated Head On Straight and the self-titled Tonic). With multiple soundtrack features, including the lead single from “American Pie” (“You Wanted More”), Tonic garnered this momentum with the release of their Greatest Hits CD/DVD package in July of 2009. Tonic, the self-titled fourth studio album, debuted on the Billboard 200 charts, while also appearing in the top 50 on the Billboard Rock Album Charts and top 25 on the Billboard Independent Album Charts. Their single, “Release Me” climbed the charts reaching top 30 at Hot AC. Tonic’s well-earned reputation as a massive live act came at a price. After finding themselves on the road for the better part of a decade, the band was ready to take a breather. In Hart’s case, that meant releasing a critically acclaimed solo album, 2007’s Cigarettes & Gasoline. The album spawned two Top 20 singles and a follow up Beauty in Disrepair in 2014. While Lavery built a recording studio and recorded/toured with a variety of acts including The Fray and the Revisionists, Russo was focused on composing for film and television, including “CSI:Cyber”, “Power”, and “Fargo” receiving an Emmy-nomination. It wasn’t long before the band was compelled to get back together and start recording. Vertical Horizon was founded in the early 1990s, but it was seven years before lead singer Matt Scannell’s songs became the radio hits that brought the popular grass roots band to national attention. Vertical Horizon released three albums independently (There and Back Again, Running on Ice, and Live Stages) and toured extensively before signing with RCA Records in 1998. In 1999, they released their breakout album, Everything You Want, which went on to sell more than two million copies. The second single off the CD, the title track “Everything You Want,” captured the #1 spot on Billboard’s Hot 100 and Adult Top 40 charts, and became Billboard’s Most Played Single of 2000. Having carved out a page in the annals of music history the band garnered further radio attention with “You’re a God” (#4 on Billboard’s Adult Chart) and “Best I Ever Had (Grey Sky Morning).” In 2005, “Best I Ever Had” became a top 20 country hit for country star Gary Allan. In addition to writing and producing songs for Vertical Horizon, Matt has spent the past few years writing songs with and for other artists. In 2010 he wrote “Wish You Were Here” for the band Hey Monday, featuring lead singer Cassadee Pope, who went on to win season 3 of NBC’s hit show The Voice. In 2012 Scannell teamed up with Daniel Powter to write “Come Back Home,” which was used to promote NBC’s “Chicago Fire.” Scannell and Grammy-winning songwriter/producer Richard Marx collaborate often and sometimes play acoustic duo shows together. They co-wrote Marx’s 2012 AC hit “When You Loved Me,” which reached number 15 on the Adult Contemporary Chart.